Hey Sasara-chan, do you like your new bag? I is like the bag… only because it’s pink ok!? Don’t forget about next year. ._. beat beat cheapskate niinii. ._. I is no want. I is medic! From Starcraft! ._. The bag looks nice but that book doesn’t…. Uncle Kenneth u is no like? ._. Which school do you go to, Sasara-chan? Why is u want to know? ._. err… special soup with special flavor. someone with special taste can taste the true flavor of the soup…but i can’t tell what’s the difference. U is taste before Agito-kun? ._.? I think he did. Write his name in your notebook, Sasara-chan. OK, me is write Aigito-kun’s name inside. ._. 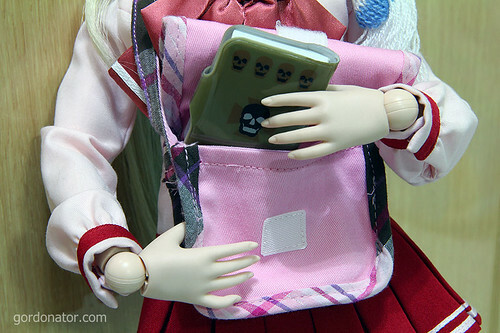 I is think Sasara-chan needs a new wallet, I is heard Prada has pink leather Wallet! I think she likes snacks more than bags … Pocky Chocolates, Tokyo Banana, etc. She finished an entire bag of Hersey kisses last week. So good Mari-chan. Too bad for me cos I is on diet so no junk food for me. Niinii says I is not fat just that I have a glamorous body. Whatever that means. ._. ?